This is a new attraction in Orange County that is rapidly gaining attention of families. You should plan to spend an entire morning or afternoon exploring the small scale town at Pretend City. Parents can sit and relax while children work in the field (picking plastic fruit out of the cubbies in the walls), work at the café (serving pretend drinks), or performing the duties of many other occupations. The kids earn play money by performing each task. It’s a great learning experience that keeps the kids entertained for hours! Located in Santa Ana just off the Interstate 5, the “Discovery Cube” it is hard to miss – it’s the giant black 3-D cube next the freeway. Admission is quite inexpensive and it offers a great educational experience for the children. The Discovery Science Center alternates different learning programs every couple of months and have a number of unique exhibits that kids love! There’s so much to do here it’s hard to know where to start! 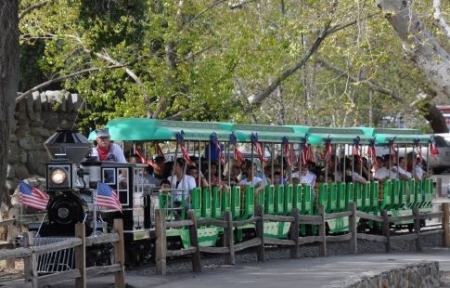 With the Irvine Railroad, hiking, Orange County Zoo, pony rides, paddle boats, and more; it’s easy to be overwhelmed with choices at Irvine Park. There are numerous holiday themed activities occurring throughout the year, so be sure to check their website to see the current events scheduled. This Orange County amusement park often gets lost in Disneyland’s shadow. With a multitude of rides, shops and other entertainment, Knott’s Berry Farm is a great value! A tip is to buy and print your tickets at home through their website to receive almost 20% in discounts for adults. They also offer AAA discounts. Be sure to say hi to Snoopy! California is very lucky to have a number of wonderful zoos, but one that frequently gets overlooked is the Santa Ana Zoo. The admission price is very affordable and has a number of attractions ranging from the Zoofari Express Train Ride and the Conservation Carousel (with endangered animals) to the Crean Family Farm and the Colors of the Amazon Aviary to Amazon’s Edge. You can spend an entire day here exploring! 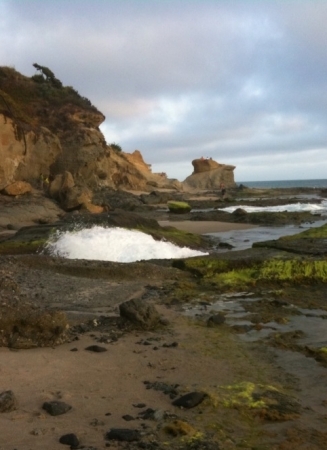 Exploring the sea creatures and plant life in tide pools, or shallow rock pools beside the ocean, is a free and relaxing way to break up an active vacation. 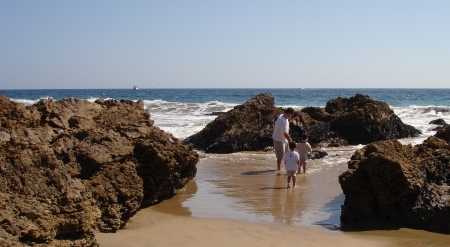 We have a number of beaches here in OC, but my family’s top two favorites for tide pooling are Crystal Cove California State Beach (right off Pacific Coast Highway at the Laguna Beach/Newport Beach border) and Aliso Creek County Beach/Montage Beach (south of downtown Laguna Beach). Other favorites if you have the chance…If you’re here in late winter/early spring, check out the whale watching boat tours that leave from Dana Point. They are spectacular! Take the ferry out to Catalina Island; it’s just a plain fun day trip! If you visit during the summer, be sure to check out Wild Rivers for a day of water slides, lazy rivers and wave action for the whole family! Katie writes about anything and everything that pertains to families at OCMomActivities and Disneyland-specific content at KidsandMice. Katie is a busy, working mother of two boys ages eight and six. When they aren’t riding the roller coasters at Disneyland, heading to the beach, or on some other adventure, you’ll find them at home in South Orange County, CA. You can follow Katie on Twitter as @OCMomActivities or become a fan on Facebook. What is your favorite Orange County activity? Let us know in the comments! We love Irvine park. It never gets old with the awesome zoo, train rides and loads of space! Thanks for including this post! I love all the wonderful adventures we have here in OC and love the opportunity to share them with your readers! I live in San Diego & have to admit that I haven’t done much exploring of Orange County beyond Disneyland. After Katie’s article, I think I’ll have to take the family up for a weekend! I especially want to check out Pretend City! Thank you for writing this story for Travel Mamas, Katie! We love all the places listed! I am excited to find another south county blogger!